What Horace Carter did have was the encouragement of his English teacher at Endy, Mrs. F. B. Hartsell. 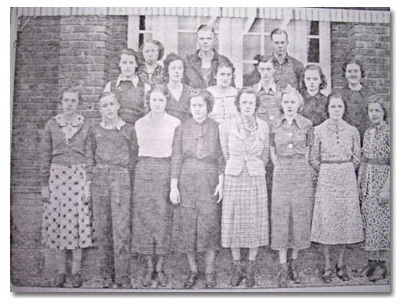 Hartsell inspired Carter to pursue his aptitude for writing, and during his last two years at Endy High School (1937-39) he wrote a column on school news for the local newspaper, the Stanly News and Press. After saving almost everything he earned from his mill and newspaper jobs, Horace Carter entered the University of North Carolina at Chapel Hill in 1939—with only $112 to his name. The “people’s University” helped him out, however, with a work study job at UNC’s news bureau, and by the time the United States entered World War II in 1941, Carter was a junior in the university’s School of Journalism. He was also anxious to support the war effort, and in January 1942, he left Chapel Hill to work in the busy shipyard at Wilmington, North Carolina. 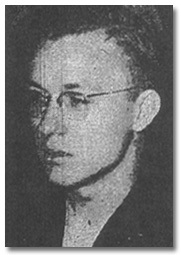 Enlisting in the Navy the following August, Carter advanced through a series of assignments in Virginia, South Carolina, and Florida before returning to UNC late in 1943 as part of the Navy’s V-12 training program. Before beginning his training in Florida, however, Carter married his fiancé of several years, Lucile Miller. 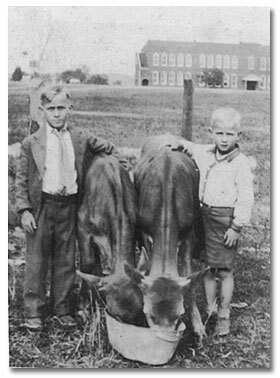 "Cile," as he affectionately called her, was the daughter of a dairy farmer near Richfield, North Carolina. 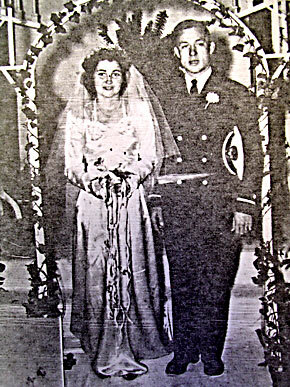 She was also a recent graduate of Appalachian State College in Boone, North Carolina, and teaching elementary school in Gastonia, North Carolina, at the time of their marriage in October 1944. Horace Carter entered the special forces program but night blindness and leg injuries soon ended his training with the Scouts and Raiders. From Florida he was sent to navigator's school in Brooklyn, N.Y. and then on to the USS Zenobia, a Navy transport vessel, where he served until completing his naval duties on January 28, 1946—the same day his wife gave birth to their first child, Linda. The young veteran also enrolled simultaneously at UNC, with the purpose of completing his degree in journalism, but then set aside those plans after accepting a position as executive secretary of the merchants association in Tabor City, North Carolina. Closely tied to his acceptance, moreover, were the related plans of local merchants to help him start a newspaper in Tabor City. 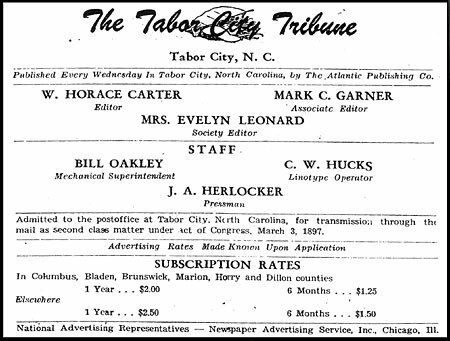 And on July 5, 1946, just weeks after he and his family moved to Columbus County, Horace Carter published the first edition of the Tabor City Tribune a weekly newspaper he edited and published. Unable to afford printing equipment of his own, Carter relied at first on the presses that belonged to James Lee Platt, a lawyer who owned the Mullins Enterprise in Mullins, S.C., some twenty miles south of Tabor City. Platt exacted a heavy price from Carter for the job: one-half of the Tribune’s gross advertising revenues. Horace Carter was succeeded at the merchants association by an older, more experienced journalist, North Carolina native Willard Cole. The two men worked closely together until the summer of 1947 when Carter leased the Tribune and moved to Chapel Hill. Although Cole continued to work for the merchants association in Tabor City, he was soon hired as editor of the Whiteville News Reporter, a twice-weekly newspaper just twenty miles away. In the meantime, Carter returned to Chapel Hill to partner with Orville Campbell in a new printing company, Colonial Press. Both men had served as editor of the Tar Heel and both were Navy veterans. They had also dreamed of starting a newspaper together following the war. What brought them together again in Chapel Hill was the contract for printing the student newspaper, the Tar Heel. Campbell received the contract and Carter agreed to return to Chapel Hill to help him print the paper. Over the next three years, Carter completed his degree in journalism at UNC and Lucile gave birth to their second child, a son they named Russell Miller Carter in honor of her family and UNC journalism professor, Phillips Russell. It was also during this time that Carter hatched a business plan with another graduate of UNC's School of Journalism, Mark Garner. Marcellus Craig Garner was a native of Meridian, Mississippi, who had graduated from high school in Asheville, North Carolina, before taking his degree at UNC and serving as a combat correspondent during World War II . A veteran of the Army Air Corps, he had returned to Asheville to work as a sportswriter and as assistant manager of the local chamber of commerce. 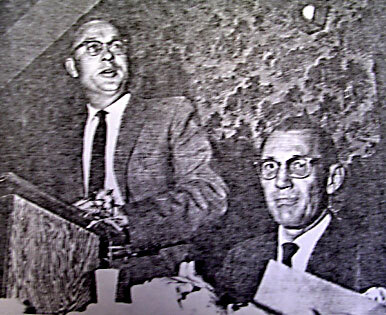 In 1948, however, Garner had moved to South Carolina to become executive secretary of the Myrtle Beach Chamber of Commerce, and by 1949, he was convinced that the booming South Carolina resort (located just 30 miles from Tabor City) could support another weekly newspaper to compete with the Myrtle Beach News, a struggling tabloid recently purchased by James Lee Platt. Horace Carter agreed with Garner's assessment, and together they formed the Atlantic Publishing Company, Inc. The new company was designed to own and print both the Tabor City Tribune and a new newspaper, the Myrtle Beach Sun. Carter received a linotype and other equipment as his share of the Colonial Press partnership with Orville Campbell, and he and Garner capitalized their new venture with funds Carter had saved from his Navy pay; with a personal loan to him from Loris, S.C. Chevrolet dealer Eldred Prince; and with funds Garner received from the sale of real estate. Carter returned to Tabor City with his family, and on June 14, 1950, the Tribune announced that it was now owned and printed by Atlantic Publishing and that Carter would be the paper’s editor and publisher. Two days later, on June 16, the first issue of the Myrtle Beach Sun hit the stands, with Mark Garner as its editor. Nowhere were the differences between the two papers more apparent than in their responses to the Ku Klux Klan uprising of 1950-52. While Carter challenged the Klan, Garner chose not to. 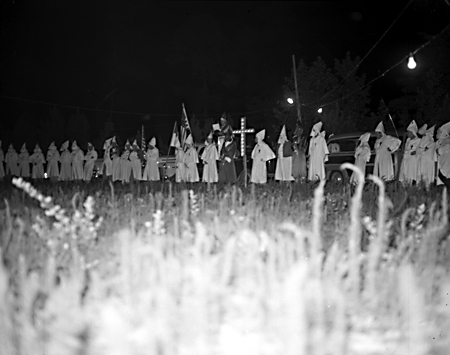 On Saturday night, July 22, 1950, the Ku Klux Klan began a recruiting drive in Tabor City, N.C. A motorcade of some 30 vehicles—most bearing South Carolina license plates and each carrying several robed and hooded klansmen—snaked slowly through Tabor City's black neighborhood before winding its way through the crowded streets downtown. Though no violence occurred, klansmen handed out membership forms and scattered leaflets from their passing vehicles. Carter responded four days later, in the next issue of the Tribune, with “An Editorial: No Excuse for KKK.” It was the first of many anti-Klan editorials that he would write over the next two years and that eventually won him a Pulitzer Prize for Meritorious Public Service. One month later, on August 26, an even larger Klan motorcade cruised through Myrtle Beach, Atlantic Beach, and Loris S.C. Leading the procession was the same klansman who had organized the motorcade across the border in Tabor City, the Grand Dragon of the Association of Carolina Klans, Thomas L. Hamilton. This time, however, there was violence. Klansmen attacked and shot up Charlie’s Place, a popular black nightclub at Myrtle Beach, and then seized and severely beat the club’s black owner, Charlie Fitzgerald. Significantly, the only participant who died that evening was a white policeman, James Daniel Johnston of Conway. Recently elected as a magistrate of the town, Johnston died after being shot in the back at Charlie’s Place, his Klan robe covering his policeman’s uniform. The Association of Carolina Klans flourished in Columbus (N.C.) and Horry (S.C.) counties between 1950-52. Carter faced potential disaster himself as a result of his two-year campaign against the Klan. Not only did he attend the Klan’s local organizing rallies, he also described what he saw there and criticized what he heard. As a result, he received hundreds of threatening notes, phone calls, and letters. And while most of these communications were directed at him personally, threatening him with bodily harm and even death, others were aimed at his family, his pets, and his business. Carter was visited twice, in fact, by the Klan's Grand Dragon, Thomas L. Hamilton, who warned the young editor: "You can't exist if we [the Klan] are put out of business, because before we go out of business, we'll have every one of our members to stop reading your paper. And I'll go talk to every advertiser you've got in town and tell them they are not to advertise in your paper." And if the advertisers complied, Carter recalled, the Tribune was sunk: "[A]nybody that's acquainted with small town weekly newspapers knows that a half a dozen people, or a dozen, can boycott your advertising sales, and you're out of business." 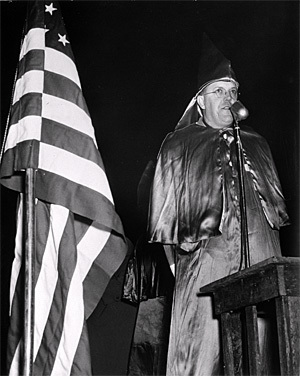 Similar threats and warnings were issued to Carter’s principal public ally, Willard Cole, who became particularly aggressive in campaigning against the Klan. Indeed, as the editor of the twice-weekly Whiteville News Reporter, which had nearly three times the number of subscribers as Carter’s weekly Tribune, Cole became the man most despised and reviled by the Klan. The Klan actions that drew the most sustained attention from Carter and Cole— as well as from the FBI, the State Bureau of Investigation, and local law enforcement officials—were the floggings that occurred in Columbus and Horry counties between 1950-52. Of the 13 floggings attributed to klansmen during this time—and there were many, many more that went unreported to authorities, especially in Horry County—only 3 of the victims were black. What was more, all 13 victims—including the African Americans—were reportedly punished for at least one alleged moral crime such as adultery, physical abuse, child neglect, not attending church, excessive drinking, or making moonshine. In February of 1952, the FBI arrested 10 klansmen on charges of kidnapping an unmarried white couple from their home in Fair Bluff, N.C., and then transporting the two across the state line into South Carolina, where they were flogged. The FBI action set off a wave of arrests for the other floggings, mostly on state charges, and nearly a hundred former klansmen, including Thomas L. Hamilton, were eventually tried and convicted in connection with the floggings. 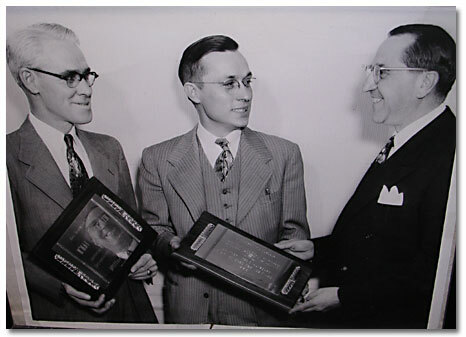 Gold medals for the Pulitzer Prize for Meritorious Public Service were awarded to the Tribune and the Whiteville News Reporter in May of 1953 for the anti-Klan crusade waged by their respective editors, Horace Carter and Willard Cole. Although Cole left his job just nine months later, in an effort to pursue other opportunities, he eventually returned to the newspaper business in Lumberton, N.C., where he died, in 1965, at the age of 58. 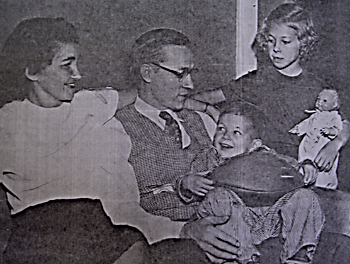 Horace Carter received numerous state and national awards in addition to the Pulitzer, and in 1954, in addition to being elected mayor of Tabor City, he and Lucile celebrated the birth of their third child, Velda Kay. He and Mark Garner also continued to buy and print newspapers through Atlantic Publishing. After acquiring two South Carolina newspapers in 1952, the Conway Field and Loris Sentinel, they purchased a third in 1953, the Ocean Beach News, which in 1954 was merged with the Myrtle Beach Sun. By the late 1950s, the company was printing nine different newspapers and finding it increasingly difficult to coordinate the diversity and dispersal of its holdings. In 1957, Garner bought the Myrtle Beach Sun from Atlantic Publishing and founded the Sun Publishing Co., which in 1961, purchased the Myrtle Beach News and merged it with the Sun to form the Sun-News. Carter continued to edit and publish the Tribune and to run Atlantic Publishing until the 1970s, when he moved to Cross Creek, Florida, and left management of the company to his son Rusty. By then, both of Carter’s oldest children, Linda and Rusty, had graduated from UNC, while his youngest child, Velda Kay, had become a student there. Carter continued writing for the Tribune while living in Florida but found a successful second career writing books about hunting and fishing and selling stories to outdoor living magazines. Following the death of his wife Lucile in 1981, Carter married Brenda Strickland and began what he later described as “the most productive time in my life as I wrote fourteen more books and another thousand articles during the twelve years that we were married.” Divorced from his second wife in 1994, Carter returned to Tabor City and to full-time work at the Tribune. In 1995, Carter married his third wife, Linda Duncan Moore. The couple continues to make their home in Tabor City, where Carter still works and writes for the Tribune.